‘Angry Birds’ Coming to Theaters in 2016!!! I have never once played ‘Angry Birds‘. So, I’m not up to speed on the whole storyline or even gameplay. I do know that it is one of the most popular game apps though. And it was only a matter of time before it was developed into a major motion picture. The game has been available for three years now and John Cohen (‘Despicable Me‘) will produce a 3D CG animated feature film of ‘Angry Birds‘ for summer of 2016. Rovio Entertainment announced that David Masiel (‘Iron Man‘) will executive produce. Let’s not forget that in October, ‘Star Wars‘ and ‘Angry Birds‘ teamed up for a ‘Star Wars‘ themed game of ‘Angry Birds‘. I wonder if that will make it in to the film. This sounds awful. On the third anniversary of the release of Angry Birds, Rovio Entertainment has announced that Despicable Meproducer John Cohen has signed on as producer of the upcoming Angry Birds movie. David Maisel, former Chairman of Marvel Studios and executive producer of Iron Man, will be executive producer of the 3D CG-animated feature film, coming to theaters in summer 2016. The film will be produced and financed by Rovio Entertainment. John Cohen most recently produced Illumination Entertainment/Universal Pictures’Despicable Me in 2010 and executive produced Illumination/Universal’s Hop in 2011. Prior to Illumination, Cohen was VP of Production at Twentieth Century Fox Animation. He worked closely with Blue Sky Studios on films including Ice Age,Robots, Ice Age: The Meltdown and Dr. Seuss’ Horton Hears a Who. Cohen had the idea to reimagine Alvin and the Chipmunks and developed the 2007 film. Following Marvel Studios’ example, which was architected by David Maisel, Rovio will produce and finance the movie outside the studio system and retain full creative control while creating innovative entertainment at the highest level of quality. “John’s experience, expertise, and passion are perfect for the Angry Birds film and I look forward to working with him to create the best movie experience for all the fans,” said David Maisel. The upcoming movie marks Rovio Entertainment’s first foray into feature films, though fans have already gotten an introduction to the Angry Birds world through Rovio’s games, books, consumer products, and animations. 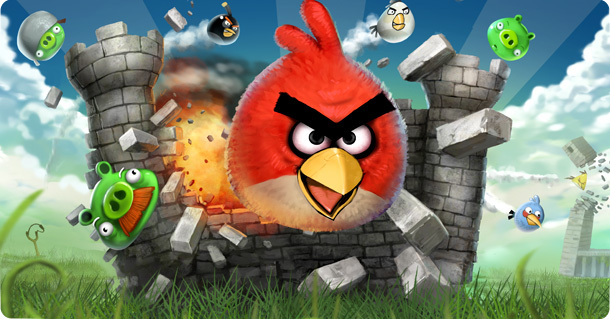 Since its debut in 2009, the Angry Birds game has been downloaded more than 1 billion times across platforms and versions. The most recent venture, Angry Birds Star Wars, soared to the top of the US iPhone charts within 2.5 hours of release. Sean Astin Showed He’s A Film Fan At Wizard World Comicon!!! Top Ten List of Technology from Films We Need Now!! Film Review: ‘Solo: A Star Wars Story’! This entry was posted on Tuesday, December 11th, 2012 at 11:58 am	and is filed under Film, News. You can follow any responses to this entry through the RSS 2.0 feed. You can skip to the end and leave a response. Pinging is currently not allowed. « See Will Smith in the ‘After Earth’ Trailer Directed by M. Night Shyamalan!!! I am not in Rome, Doug. I am in a rush.